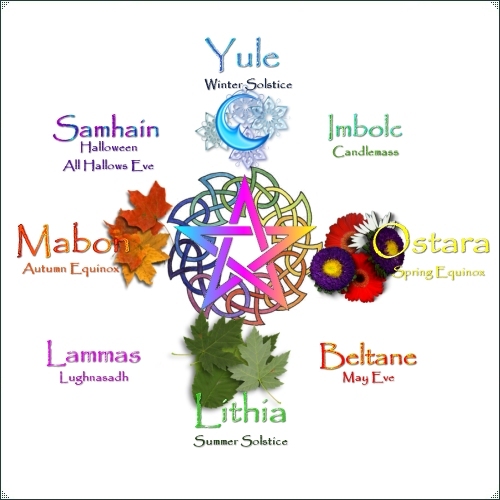 The Wheel Of The Year: The Four Seasons are known as Solar Festivals, the cross quarter days are marked by Fire Festivals, together they form The Wheel of the Year. The Festivals of the Wheel Of The Year also represent the active and dormant states of nature, man and agriculture. Each of the festival days was ruled by a governing deity, whether a God or Goddess, with each region having its own associated deity. From planting to reaping to winter to summer... the seasons were of great importance to our ancestors, for their very existence depended upon good harvests, mild winters, enough rainfall. A solstice is an astronomical event that happens twice each year when the Sun reaches its highest position in the sky as seen from the North or South Pole. The word solstice is derived from the Latin sol (sun) and sistere (to stand still). 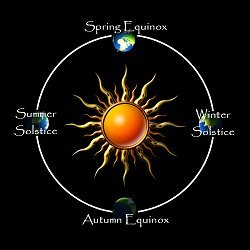 The name "equinox" is derived from the Latin aequus (equal) and nox (night), because around the equinox, the night and day have approximately equal length. Ostara - Spring Equinox - March 21st/22nd. It is traditionally the day of equilibrium, neither harsh winter or the merciless summer, and is a time of childish wonder. Summer Solstice - 21st/22nd June. Midsummer or the Summer Solstice is the most powerful day of the year for the Sun God, this Sabbat glorifies the Sun God and the Sun, and fire plays a very prominent role in this festival. Mabon. September 21-23. Technically, an equinox is an astronomical point and, due to the fact that the earth wobbles on its axis slightly , the date may vary by a few days depending on the year. Beltane 30th April - 1st May. This festival is also known as Beltane, the Celtic May Day. It officially begins at moonrise on May Day Eve, and marks the beginning of the third quarter or second half of the ancient Celtic year. Lammas: This is an Irish Gaelic name for the feast which commemorates the funeral games of Lugh, Celtic god of light, and son of the Sun. Samhain: Halloween - October 31st. Samhain is one of our four Greater Sabbats, the highest holy day of witches. It is a cross quarter day, situated between Autumn Equinox and Winter Solstice.